It could be that I’m not going to the right parties, but I’ve never experienced a true-life instance of the meme where a try-hard bro pulls out his acoustic guitar to strum “Wonderwall,” ruining the chill ambiance for everyone. Neither have I heard the 1995 hit single, certainly the best-known song from the catalog of the fabled Britpop band Oasis, played by a busker — though recently some Danish cops sent a street performer home to practice when they heard him butchering the number in public: “The guitarist played very badly and loudly,” the police report stated. “Just because you can play ‘Wonderwall’ does not mean you have to.” And legend has it that back in the group’s heyday, music shops banned customers from plunking out those infamous chords on the merchandise. The culture insists that we are assaulted on all sides by novice guitar guys who want to impress us with their take on “Wonderwall,” but have you ever met these characters? Is the myth just that — a myth? I’m not alone in wondering. 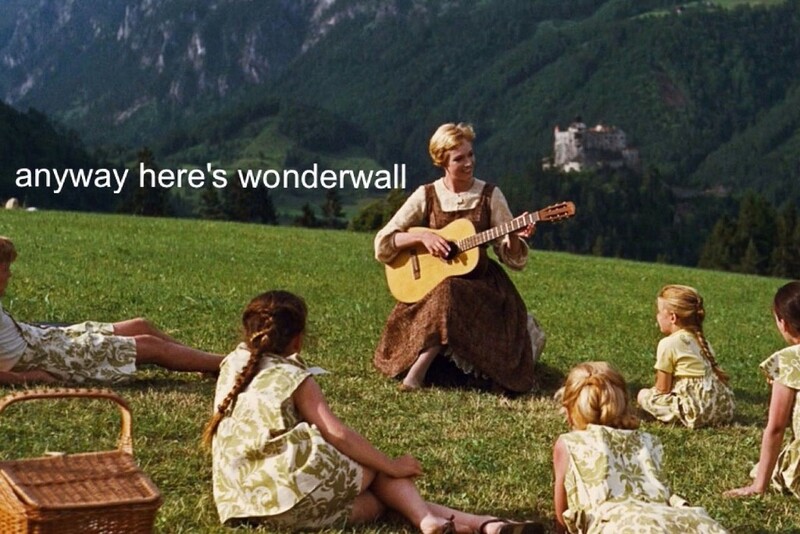 We know that “Wonderwall” is easy to learn, suitable for beginners, yet so are “Love Me Do” and “Knockin’ on Heaven’s Door,” and they don’t enjoy meme status. “Wonderwall” didn’t even hit number 1 in the U.K., stuck under Robson & Jerome’s schmaltzy cover of the 1953 chart-topper “I Believe,” named the year’s worst record by NME. (Jerome has lately enjoyed a more respectable turn as Bronn on HBO’s Game of Thrones.) Yet as we breezed past the track’s 20th anniversary, something of its ironic power was cemented. It’s no longer possible to tell whether “Wonderwall” is a cliché because amateurs supposedly play it so often or if the cliché is what draws them into its field. This is compounded by the song now serving as shorthand for a lack of self-awareness. In that sense, this Oasis jam is the spiritual opposite of Rick Astley’s “Never Gonna Give You Up,” a music video that trolls have duped people into watching for years, in a practice known as Rickrolling. Where Astley is a stealth attack, “Wonderwall” must be officially announced in a way that demands attention under the guise of humility. “Anyway, here’s ‘Wonderwall,’” the would-be rock star says, affirming the redundancy at the heart of the song’s phenomenon — who wouldn’t recognize “Wonderwall” from the very first splash of E-minor? Or does it sound too much like too many other songs? The paradox of stripped-down pop hits is that they feel at once unique and common, passed down through a sonic tradition yet born out of their moment. “Wonderwall” is among those instances where art is supremely obvious, but only in retrospect. Which is why members of U2, Metallica, and Blur have all kicked themselves for not writing it first. “Wonderwall” can’t be written now, since it already exists; between its ubiquity and elemental construction, it seems to have always existed. We cannot divide history into pre- and post-“Wonderwall” eras, as if it lurked somewhere in the ether until Noel Gallagher casually snatched it for himself. Oasis was far from a one-hit wonder, yet the song is bigger than the band, and this haunts them as it haunts every single acoustic guitar observed at rest in the corner of a dingy dorm room. Somewhere, someone is practicing “Wonderwall,” and it’s playing a coffee shop down the street, and a radio DJ in the city nearby is unsheathing the remastered version. It’s less a classic than a state of mind, the ideal fusion of rock’s nihilism and hope: Nothing matters, so you’re free. Anyway, here’s a melody you’ve heard before. We just don’t know anything different.